Recombinant monoclonal antibody to TRP-1, gp75. Manufactured using AbAb’s Recombinant Platform with variable regions (i.e. specificity) from the hybridoma TA99. Immunogen: 70-75 kDa pigmentation-associated glycoprotein in human melanoma cell lines. Specificity: Binds Tyrosinase-related protein-1 (TRP-1), a 70-75k enzyme located in melanocytes, which are specialized cells that produce a pigment called melanin, helping to stabilize tyrosinase, which is the enzyme responsible for the first step in melanin production and determine the shape of melanosomes, which are the structures in melanocytes where melanin is produced. Application Notes: This antibody binds to human and murine TRP-1 and had been under evaluation for the treatment of tumours. Note on publication: Describes the isolation of TA99 from mice immunized with the pigmented melanoma cell line SK-MEL-23 and the characterisation by radioimmunolocalisation showing the tumor imaging. 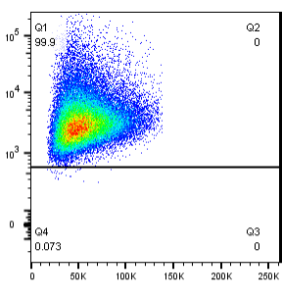 Flow-cytometry using anti-CD3 epsilon (Ab00105, 2C11 scFv) and TRP1 (Ab00180, TA99) antibodies. Mouse splenocytes (A), B16F10 murine melanoma cells (B), KPC3 pacreas carcinoma cells (C) and KPC3 cells transfected with the Trp1 gene (D) were fixed using 2% PFA, permeabilised using 0.5% Triton and were subject to a primary treatment of either buffer, mouse-IgG1 chimeric 2C11 or mouse-IgG1 chimeric TA99 (indicated above plots) before a secondary treatment with buffer, goat anti-mouse Ig-allophycocyanin (G-aM Ig-APC) or anti-HisTag-APC (aHis-APC) antibodies (indicated beside plots). In panel A, splenocytes were also stained with a commercially available anti-CD3 (2C11) antibody conjugated to phycoerythrin (PE); all cells (i-v) were CD3 and thus PE positive. In subpanel ‘A v’ an increase in APC fluorescence intensity (FI(APC)) indicates binding of aHis-APC to 2C11 bound to CD3 at the cell surface. Some Ig containing proteins expressed by the splenocytes may explain the increase in APC fluorescence in subpanel ‘A iii’. In panel B an increase in FI(APC) in subpanel ‘iii’ indicates that TA99 binds to heavily expressed TRP1 at B16F10 cell surfaces and is then detectable using an G-aM Ig-APC antibody. Conversely, G-aM Ig-APC did not detect 2C11 at the cell surface, whereas a subset of cells with 2C11 bound to the surface were detectable using aHis-APC. Panel C shows that TRP1 is not detectable in KPC3 carcinoma cells (‘Ci, iii, v’) as expected, and that again, aHis-APC is able to detect a small subset of CD3 expressing cells (‘C vi’). When transfected with the Trp1 gene, KPC3 cells then strongly express TRP1 and it becomes detectable (‘D iii’). A small subset of CD3 positive cells was again detectable in Trp1 transfected KPC3 cells (‘D vi’). All analyses were made using FACSCanto flow-cytometer.